Why not experience an exotic grilled chicken kabobs recipe with worlds more flavor than the same old plain, dried-out chicken kabobs everyone else makes? 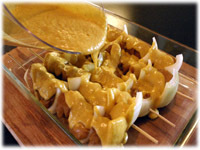 The soft delicate island flavors of Mango plays the low and slow partner to the wild and robust curried flavors of India making this chicken curry recipe a thrill on a stick. 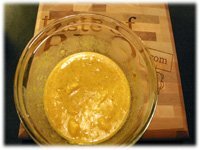 Half the mango curry dipping sauce is used for the marinade and the other half reserved to dip with or drizzle over the kabobs when their cooked. And here's another neat trick you can do with these grilled kabobs when they're cooked, wrap them up in fresh homemade crepes. You can learn how to make crepes here. 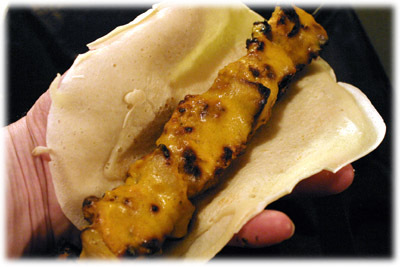 All you do is cook the chicken kabobs recipe, wrap a crepe around one and pull out the stick. Great for a Friday night kitchen party with a few of your friends. 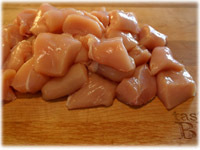 Cut the chicken into large 1" cubes, cover and set aside. 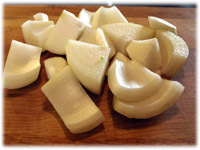 Peel the onion and cut into large 1" chunks, cover and set aside. 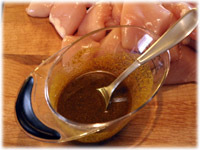 Mix the rub recipe ingredients, oil, curry powder and paste together in a small bowl. Place the chicken in a resealable plastic bag and pour in the rub ingredients. Squish the bag around really well so all the surfaces are completely coated with the rub recipe. 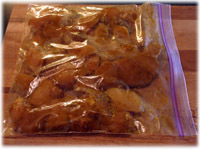 Place the bag in the refrigerator while you make the mango curry marinade/dipping sauce. 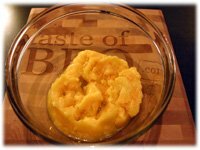 In a small bowl use a potato masher or fork to smush the thawed mango so it's smooth, then add the lime juice and mix well. 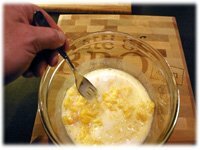 Add the coconut milk and blend well with the mango and lime. Add the curry powder and blend well with the coconut, mango lime mixture. Open the plastic bag of chicken thats been sitting in the rub. 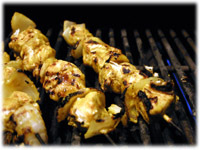 Thread a piece of onion on one of the kabobs skewers, then a couple pieces of chicken. Alternate chicken and onion finishing with onion (helps keep the meat on while cooking). 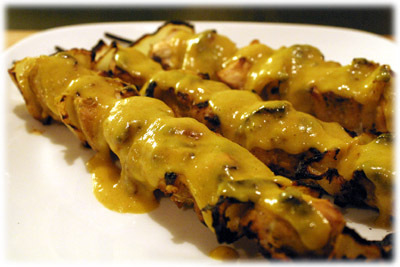 Place the chicken kabobs recipe in a shallow dish and pour 1/2 of the mango curry marinade/dipping sauce over the kabobs. 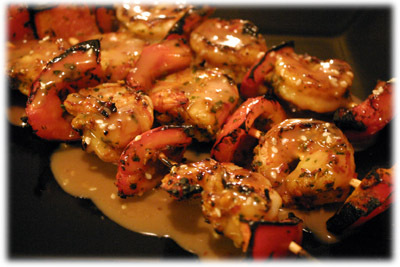 Rotate the kabobs in the dish so every surface is covered with sauce. 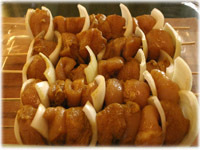 Cover and refrigerate at least 4 hours or up to overnight. When the grill reaches temperature place the chicken kabobs recipe on the grates and close the cover. After several minutes check on the chicken and wiggle each skewer slightly with your BBQ tongs to loosen from the grates. Rotate a 1/4 turn to keep each side browning evenly. 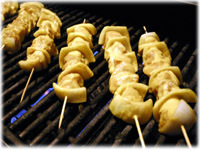 After 10-12 minutes and after rotating the skewers around the grill the chicken should be cooked. Look for an internal temperature of about 165F. 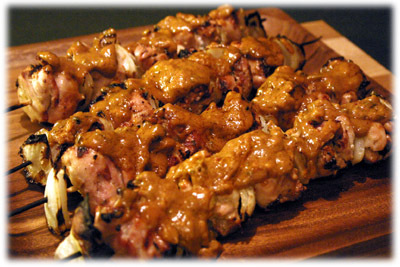 Remove the chicken kabobs from the grill and place them on a serving platter. 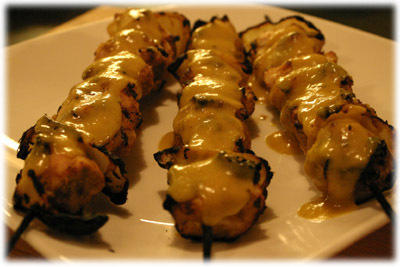 Drizzle the reserved Mango Curry sauce over the skewers or serve on the side as a dipping sauce. And don't forget, these little rascals are great wrapped in a nice fresh, fluffy crepe. 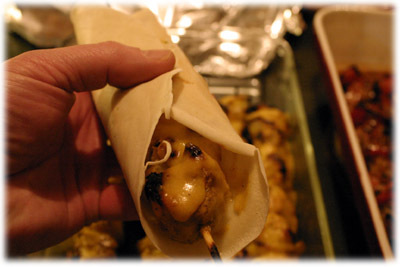 You can learn how to make crepes here, grill up these chicken kabobs, wrap them in a crepe, pull out the skewer and hand them out to an eager crowd.